It looks like Meghan Markle is doing a good job of making friends behind palace doors. There’s a new report that suggests Meghan Markle and Princess Eugenie have become rather close lately, leaving Kate Middleton feeling snubbed. As a matter of fact, many eagle-eyed royal observers noticed that Eugenie even showed her support for the Duchess of Sussex on social media recently. There’s a new report that suggests Princess Eugenie is a fan of Prince Harry’s American wife and that she is apparently showing her support for her on social media, even though Meghan Markle deactivated all of her accounts. 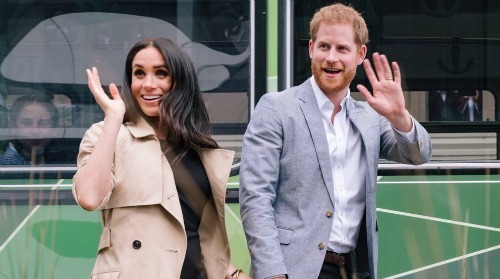 One eagle-eyed royal observer noticed that newlywed Eugenie supposedly liked a photo of the Duchess of Sussex wearing a pair of Natalie Marie earrings. The post came from a Meghan Markle fan page that Eugenie isn’t following, which means that she found the photo on her Instagram discover page. Earlier reports indicated the Princess Eugenie and her new husband Jack Brooksbank visited the Duke and Duchess of Sussex at their home near the Cotswold before their wedding. There were already reports indicating that Meghan Markle’s baby bump was pretty visible at Eugenie’s wedding at Windsor Castle last Friday. The Duchess of Sussex waited until a couple of days later to announce her pregnancy, as she clearly didn’t want to steal Eugenie’s thunder on what was the most important day of her life so far. And while no one knows what kind of relationship Meghan and Eugenie have behind palace doors, one thing is for certain: both Eugenie and her sister Princess Beatrice have often kept their distance from Kate Middleton. As a matter of fact, royal critics have noticed that the sisters often look unhappy or frustrated whenever they are photographed behind the Duchess of Cambridge at family gatherings and royal events. That doesn’t seem to be the case with Meghan Markle, though. Meghan has made quite an effort to reach out and get to know everyone in the British royal family. There’s a strong possibility that Eugenie and Meghan are simply getting along quite well right now and might even become close friends and confidants in the future. So far Buckingham Palace has not made any comments about Princess Eugenie and Meghan Markle’s friendship. In the meantime, don’t forget to check back with CDL for all the latest news and updates on Princess Eugenie, Meghan Markle and the rest of the royal family right here.